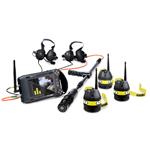 LEADER Hasty Wireless Life Detector & Search Camera is the world's first and only true Hasty search system that combines search cameras, listening and victim communication devices into one unit. Microphone / speaker placed on the head of the camera also allows communication between rescuer and victim. Simply SEE, SEARCH and SAVE with just one tool! LEADER Hasty has been especially designed to offer a lightweight, mobile and efficient method of performing a fast and reliable hasty search. 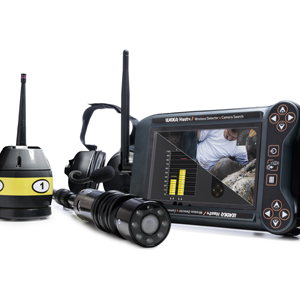 The ability to switch instantly between visual and audible search in one deployment greatly decreases the time taken to search for victims and increases their chance of survival. Easily replaceable lightweight compact rechargeable battery. 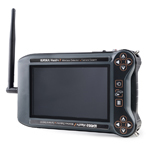 Battery compatible with LEADER Search, LEADER Cam and LEADER Scan control boxes. Backup pack for 10 AAA batteries (not supplied). Makes the device functional even if the battery cannot be charged during rescue operation. "Articulated arm" supplied for mounting the control box on the pole. 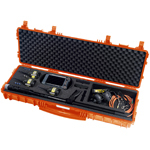 1, 2 OR 3 WIRELESS SEISMIC SENSORS CAN BE CONNECTED TO DETECT SOUNDS FROM CASUALTIES. ADJUSTABLE NOISE REDUCTION FILTERS TO ELIMINATE UNWANTED LOW/HIGH NOISES FROM PNEUMATIC DRILLS, VEHICLES, THE WIND, ELECTRIC POWER CABLES, ETC. MONO OR STEREO MODE FOR LISTENING TO THE SELECTED SENSORS IN ONE OR BOTH EARS. Noise-reducing design to provide great listening quality without disruptions. Microphone with integrated noise reducer for clear communication with casualties. 1 or 2 sets of headphones can be connected simultaneously.